SYDNEY, 4 July 2008 AAP - How did a short, fat, innocuous-looking man convince a legion of ultra-conservative Catholics that he was God's prophet and then sexually assault two of their underage daughters? William Kamm, known to his followers as The Little Pebble, founded the Order of Saint Charbel at Cambewarra, near Nowra, on the NSW south coast two decades ago. Claiming he was God's spokesman on earth, that he communicated with the Virgin Mary and would be the last Pope of the Roman Catholic Church, he manipulated a sect of old-line Catholic traditionalists to hand over their wives and daughters to populate his 'Royal House'. How he manipulated an entire community to not just condone, but glorify his sexual exploits sparked Graeme Webber's three-year obsession with Kamm, captured in his newly-released book, 'a WOLF among the SHEEP'. According to Webber, Kamm fathered more than 20 children and duped dozens of females into sexual relations, telling them they were among the 12 queens and 72 princesses he had chosen to re-populate the earth after Judgment Day. Kamm, 57, has only ever faced two sets of charges. He is currently serving a seven-and-a-half-year non-parole period, with a maximum term of 10 years, after being convicted of the sexual assault of two teenage girls whom he convinced to sleep with him by telling them it was God's will. What first intrigued Webber - who covered every day of both of Kamm's trials and spent three years researching 'a WOLF among the SHEEP' - was how so many smart and strictly religious people were so sucked in by Kamm. 'I was baffled to discover so many intelligent ex-members of the Order of Saint Charbel, founded by Kamm, who were not crackpots - so why had they dedicated their lives to one?' he writes in the book. 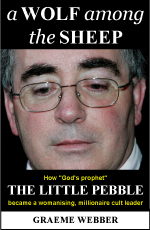 The Little Pebble's exploits have made headline news since 2002 when the Vatican denounced his cult and he was arrested for the girls' assaults committed in the early 1990s. But all the while, his faithful flock have stood by him, saying the 'mystical marriages' were his divine right. Dozens of his followers crowded the courtroom throughout both of his trials and have remained true to his doctrine while he has been imprisoned. Even the mother of one of the abused girls still believes in, and lives in, the Cambewarra community. There have been numerous exposés in the press and television documentaries, but few of The Little Pebble's followers have budged in their devotion. Webber says he knows the cult members too well to think he has any hope of convincing them of Kamm's faults with his book. 'They denied that he's guilty of these two sets of convictions, but within the trial it was clearly admitted by the defence that there was a process when he would go away with groups of girls [albeit over the age of consent] and sexual activities would happen,' he said. Webber says that showing dedication by sitting in court throughout both trials helped him convince ex-cult members to assist him with his research, but even as Kamm took the stand for sexual assaults they were still utterly convinced of his divine powers. That is, until Webber brought up finances. It appears even in the warped world of the cult, money talks. 'Kamm's greed largely went unnoticed because of the belief that any money he received went into Mary's purse for God's work,' Webber writes in 'a WOLF among the SHEEP'. Webber says Kamm's sect has failed to put in financial returns since mid-2005. Webber is critical of the approach of government financial regulators towards Kamm, as well as that of the Catholic Church. 'They put out decrees denouncing him ... (but) there's got to be criticism of the efforts they made to stop him ... they could've been a better circuit breaker,' he said of the church. Last month, Kamm lost a High Court bid to appeal against convictions relating to one of his victims. He is understood to also be appealing the second set of convictions. As his sentence stands, he will be eligible for release on April 13, 2013.